Does Nitric Flow Extra Work to Build Muscle? You are reading this because you have either decided to embark on the road toward one of the greatest achievements in human history by attempting achieve the ultimate body or you are already well on your way but know that you need something that can help you reach the mountain top. Whichever the case may be there is one thing that any serious bodybuilder knows and that is that they must squeeze every ounce of benefit from each and everything that they do. From each and every workout to each and every recovery period to every ounce of nutrition every single thing that a bodybuilder does in their pursuit of the ultimate achievement must be done with the greatest possible result in mind. This is also true when it comes to the use of bodybuilding supplements, which in today's world, are critical to competing at the highest levels. The reason for this is that when it comes to getting the best possible results one of the key things that is required is having as much oxygen and nutrients as possible flow to all the organs and muscle groups in order to give them everything they need to grow and flourish. The good news is that over the last several years there have been some great advances in the types of products which are available to make that happen. This is evident in the increasing results shown by bodybuilders using them. The bad news is that, because of the great success that many of these products have had in recent years, the market for these products has ballooned to the point where there are now seemingly hundreds of them available and telling the good from the bad is getting harder and harder by the day. This task is made even more difficult by the fact that so many of them use the same basic ingredients and make nearly all the same claims. Keeping all of this in mind, we, as part of our ongoing efforts to help our many valued readers find the products that will likely work the best for them, have decided to take a long hard look at one of the most talked about bodybuilding supplements available today - it's called Nitric Flow Extra. An interesting fact about this product is that it does not have its own official website but does appear to have a number of third party sites promoting it. Oddly, there are even sites that promote it as a male enhancement supplement designed to promote stronger, firmer and longer lasting erections while providing more sexual stamina and endurance. 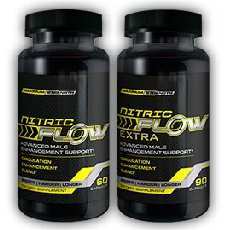 There is a distinct lack of quality and detailed information regarding the ingredients in Nitric Flow Extra. The one key active ingredient that we can be sure of is L-Arginine which is a well-respected and widely used critical amino acid known to help boost the production of testosterone in male users. As mentioned above the lack of detailed or useful information is more than disconcerting and this feeling extends to the fact that we could find no information related to data on any research, studies or clinical trials. This is important given that fact that most products depend not only on having top quality ingredients but in the way these ingredients may be formulated. The formulation can have an even greater effect on how effective the product is and how safe it is to use. For instance, a poorly formulated product could include insufficient amounts of key ingredients that would render them ineffective and without research, studies and trials there is no way to know how effective or safe the product will ultimately be. After a diligent search of the internet we could find no evidence of any clinical research, studies or trials that would show any evidence of data that would support the many claims made for Nitric Oxide Extra. Clearly most savvy consumers understand that most companies tend to use testimonials and user reviews to promote their products as a selling tool in order to make potential customers believe that their existing customer base is really happy with the product. When these types of comments are used on websites or other marketing materials that are under the control of the seller there is an obvious and inherent bias that comes into play. Because of this we always attempt to find other, more independent sources of user reviews. In a search of industry related websites that have no known connection to Nitric Oxide Extra or its producer as well as several chat rooms known to discuss male enhancement products we found a wide array of independent user reviews for this product. Reviewing them as a whole it became clear that the vast majority of them were of a highly negative nature. The most common theme among these negative reviews was that Nitric Oxide Extra did not live up to the many claims made for both the efficacy and safety of the product. Being that the total ingredients are unknown there is no real way to determine whether or not there are any significant health or safety concerns including issues regarding side effects. No matter what the concerns it is always advisable to seek a consultation with a physician or other qualified medical professional before beginning use of this or any other product of a similar nature. This product is available through a large number of online retail outlets. Pricing across these platforms does vary significantly but the average cost of a one month supply is approximately $39.95. At the start of this review we discussed the importance of serious bodybuilders doing everything they possibly can to squeeze every bit of benefit out of everything they do including workouts, recovery periods, nutrition and the supplements that they choose. Considering all that we know about Nitric Flow Extra there are just three basic factors that one should take into account when determining whether this is one of the best male enhancers on the market today. One is the list of ingredients used and, to this point, the lack of knowledge the public has is a serious issue. The second factor is the similarly serious lack of information related to the way in which Nitric Oxide Flow is formulated. Clearly this lack of information related to research, studies or clinical trials in just another black mark on the record. The third and last factor is the fact that the vast majority of independent user reviews were nothing less than highly negative in their comments on their experiences with this product. In the end there is no doubt that Nitric Oxide Flow has not done what it takes to be anywhere close to being one of the best options for serious athletes and bodybuilders.